Wonder what she’s slipping out of her glove? And I assume Tyler and his bag are on the ceiling now? A piece of spearmint gum.
. . . well that’s not suspicious at ALL. What’s she getting out of her glove, there? A logical answer would be a scanner of some sort. Oooo… just thought it could be a specific winning raffle ticket for the event that’s on. Make him win one of the items. Doesn’t make sense. All that junk used to be Tyler’s anyway. The Marlockes are just taking re-gifting to a new level. I think this may be Ron’s stuff which makes it a little different than an overly complex plan to get Tyler an item that is already his. I’d be willing to bet that she’s trying to blame tyler on something that he did to her, and that’s why cecil recognises her. She’s been targetting Tyler (or his room) all this time… Why? Do you think that that’s Sarah, just with the power thing from P+G, as a sort of helping prebonus? It could work… Remember, she said she didn’t used to be brunette. It’s possible, but it makes her previous interaction with Tyler at the party weird and inconsistent. She started offering Tyler the chance to get superpowers but now she’s going forward anyway without him? However, that could have been just a ruse to get into his room. Maybe it’s a note with instructions for him. 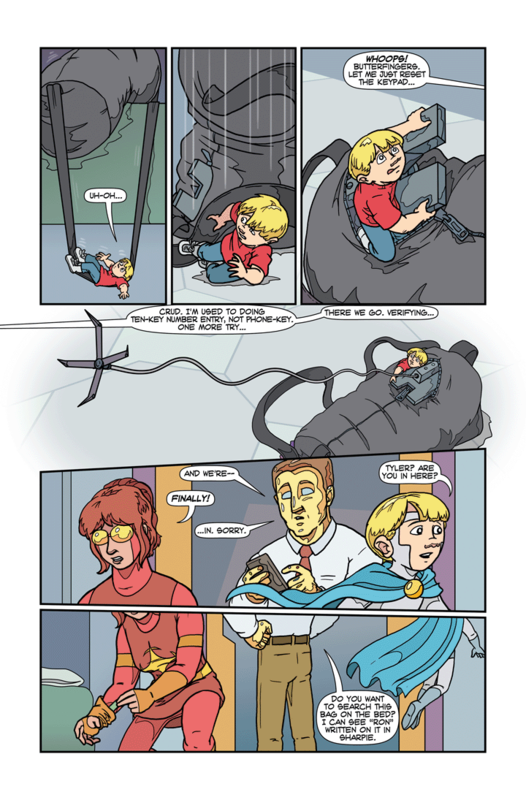 Young girl see’s Tyler and possibly Ron as competition for her chance at superpowers, but thinks she has figured out a way that they can all get superpowers if they work together. I get the impression that she might take their not having a clue what she’s talking about as a sign that they are unwilling to cooperate. Oh, and hey, I was coincidentally right about the numpad / keypad discrepancy. I really want to say Mr. Alloy was purposely delaying, like it seems far too coincidental that he gave Tyler enough time to hide his Moon Knight stuff. That’s actually possible though time travel may be required. After Moonshadow’s “death” during the Alien Invasion, it may have become an open secret among the faculty, if only to keep an eye on the clone/Toby. He would still need to know to stall. He doesn’t know there is a reason to. A pretty cool Marvel charecter if I’m not mistaken ? Do we know what if any super senses Mr Alloy has if he has super hearing he could hear little kids talking in the ducts or if he can see heat or through walls he may know what the kids are up to. It would then be a question of how much he trusts Tyler. Well I’m guessing ‘Super senses to detect Tyler and cover for him’ isn’t the answer we’re going to end up seeing. Planting evidence usually doesn’t work well when presumably the super-forensic sciences would easily show Tyler’s never had any contact with the item in his life, buuuuut given how insane his parents is and easily misled supers seem to be I imagine the thought of even basic fingerprint analysis to see if he’s possibly touched whatever she’s going to plant will never occur to anyone. My money is on bugging Tyler’s room, because information is more useful than blackmail. Annnd here comes the backstab. Cecil,s coat does not like her. The coat is a creation of the forces of Chaos. She may be an Agent or Champion of Order trying to find out if Tyler is a Agent of Chaos. This could be part of the Eternal war between Order and Chaos, we haven’t seen any response yet to Toby being empowered by Both, like Marvels In-Betweener or DC’s Equinox. Toby’s not empowered by Order or Chaos though, his powers were TAMPERED with by agents of Order and Chaos because they wanted to make it so he couldn’t do something orderly or chaotic without a countering event to make his actions meaningless with regards to Order and Chaos so that he couldn’t advance the cause of either. Supposedly they’ve worked out a way around that limitation but we’ve not seen the evidence yet as to how successful they were in doing so. That’s my take on it too. I believe that they granted him freedom not power. Between his healing factor, and the underwhelming explosion his server link had I think he would have survived too. I sort of wonder how Toby would have turned out if they didn’t intervene. Yes, given that Toby was functional when the strings were cut with Tyler when he actually didn’t have that brain mass available to think with I imagine just like Amazo from the animated Justice League blowing off Toby’s head won’t kill him he’ll just regenerate everything. It is an interesting thought how he’d have gone if they hadn’t gotten involved and Von Fogg had set off the detonator on the clone when it still was linked to Tyler and not in possession of free will. He may have died as it seems like the tampering to free him also unlocked his powers (that’s the first time we see Toby display powers, when they begin messing with him) due to not having the powers active to save him. Once he had the active powers because of them he then no longer actually required his brain to survive so could remove the brain-device and grow some replacement brain matter to think with. So while he apparently needs a brain to think he can survive without it. It’s a murky area. So are you saying that because Toby has been Tampered with by Chaos and Order instead of Empowered by them that agents of Order would not be suspicious of him. No, more likely it would mean he’d probably come off ‘wrong’ to agents of BOTH Order and Chaos since he’d have the taint of both on him. But so far we haven’t enough information to know why Cecil’s Cloak Of Chaos is reacting as it is, while it might just be because of Toby’s unnatural nature or the taint of Order on him it could be misdirection by Aaron and it’s because of something he’s carrying or something we can’t see or don’t realize is its actual target of enmity.